Canada’s Cheapest Copper Developer is on the Verge of a Breakout | Energy and Gold Ltd.
During the five year downtrend in copper, which saw the price of the metal drop by nearly 60% from its February 2011 peak (US$4.65/lb) to its January 2016 low (US$1.94/lb), junior copper/gold explorers were on the defensive, trying to advance their projects as best they could during a very challenging time to raise capital and draw investor interest. However, in the last year we’ve seen some major developments in the copper sector which include the copper price recently climbing back above the key psychological US$3/lb level. As gold breaks out above major levels of previous technical resistance while base metals enter what could be the next cyclical bull market cycle, junior metals explorers could be the next market sector to surge to the upside. As metals prices sunk, investors had mothballed and stopped caring about junior metals explorers sometime around 3-4 years ago (2013-2014), but now now this sector could become a major area of opportunity as the investor spotlight returns. The rule is that the senior producers will generally move first (as we have seen with BHP, FCX, HBM, TECK, etc.) as they are best positioned to immediately see improvements in profitability as metals prices turn. Then, the junior explorers will get in the game as senior producers seek to replace reserves (through acquisitions and strategic investments) and project economics become compelling once again (due primarily to higher metals prices). Two of the most important aspects of junior mining investing are location (jurisdiction, infrastructure, etc.) and mine life. A top tier jurisdiction, (Australia, Canada, U.S. etc.) with substantial infrastructure in place in the surrounding area, already leapfrogs multiple headaches that junior resource investors regularly encounter when investing in riskier, less built-up jurisdictions. Moreover, a project with a 20+ year mine life allows a project to capture at least two metals cycles (as opposed to projects with a ten year or less mine life which allows much less margin for error in terms of timing the macro cycle). Enter NorthIsle Copper & Gold (TSX-V:NCX), with its North Island Project on North Vancouver Island in British Columbia, Canada. 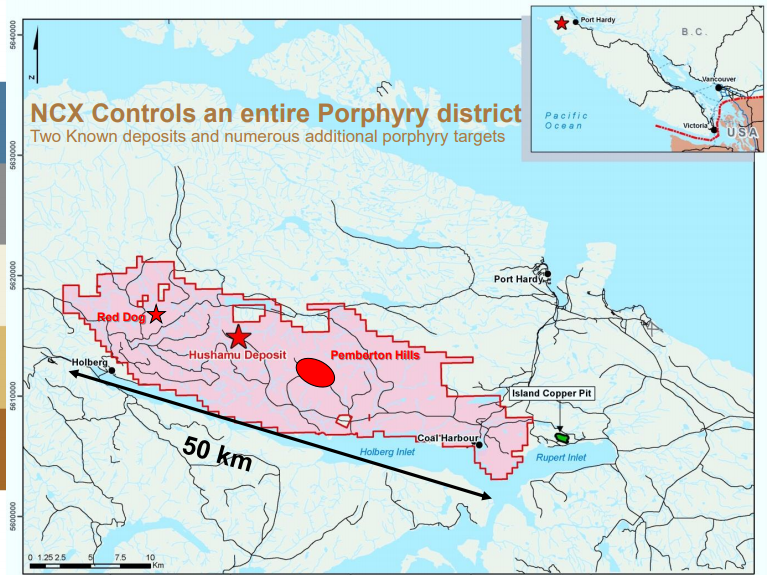 The North Island Project is a 33,150 hectare block of mineral titles, 100% owned by NorthIsle, stretching northwest from the now closed Island Copper Mine of BHP Billiton, which is located 10 km south of Port Hardy. The North Island Project covers a 50 by 8 kilometre block of a highly prospective porphyry copper, with two confirmed deposits (Hushamu and Red Dog), and several mineralized occurrences, including Pemberton Hills and NW Expo. Hushamu is the largest deposit with an Indicated Resource of 305 million tonnes grading 0.21% copper, 0.29 grams/tonne gold, 0.01 molybdenum and 0.55 gpt rhenium. 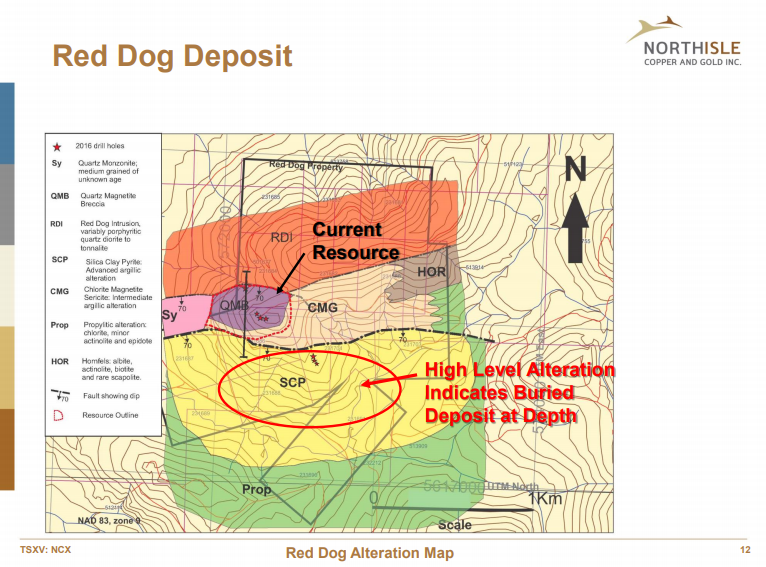 while the Red Dog has a smaller, but higher grade Indicated Resource of 24 million tonnes grading 0.32% copper, 0.42 grams/tonne gold and 0.001% molybdenum. One of the major attributes of the North Island Project is the excellent infrastructure surrounding the project, which includes: an airport, hospitals, schools, deep water load out facility and main BC Hydro power grid, all within a 40 minute drive of the main mineralized areas of the project. This tremendous infrastructure in the area supports the economics of the North Island Project and helps to create synergies with the surrounding communities. NCX can also boast strong, experienced leadership with President & CEO Jack McClintock (MBA, P.Eng Director) at the helm. Mr. McClintock has 30 years experience in the mineral exploration business and was formerly Exploration Manager for BHP Billiton. He was instrumental in the discovery of the Spence copper mine and the West Zone of the Cerro Colorado copper deposit in Chile. Mr. McClintock was also the winner of the PDAC Prospector of the Year award in 1998. 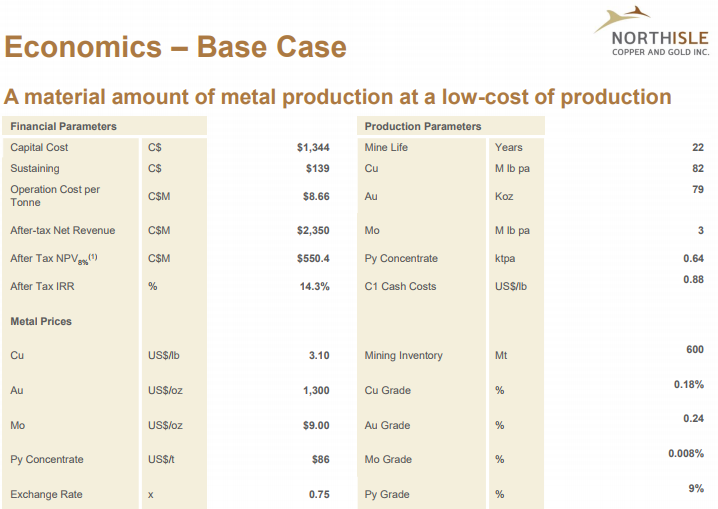 Typically 0.21% copper and 0.29 grams/tonne gold aren’t exciting grades. 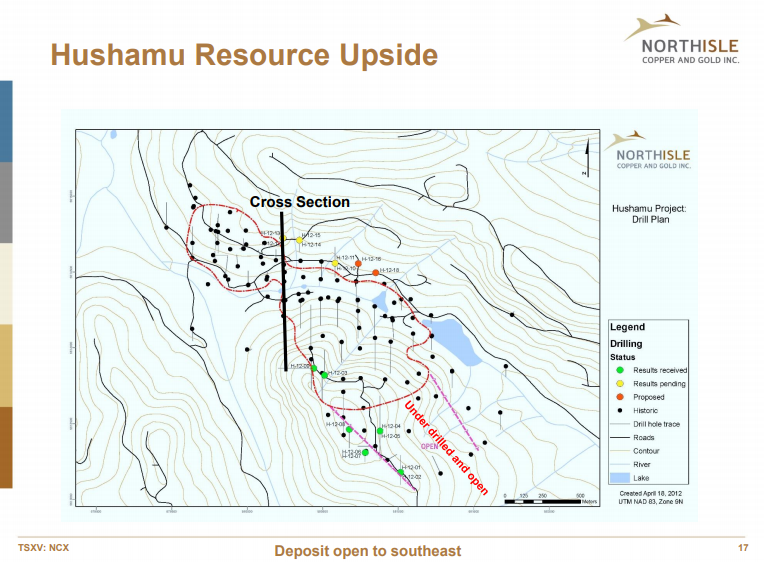 However, when we’re talking about more than 300 million tonnes of ore with an additional potential starter deposit (Red Dog), with ~24 million tonnes grading 0.32% copper and 0.46 grams/tonne gold, which is 10km by road from the main Hushamu Deposit, suddenly the economics become much more compelling due to scale and metallurgy. The operating cost per tonne of C$8.66 is crucial because it is this low operating cost that generates an impressive margin when considering that each tonne of ore has an average of $17.61 in payable metal, a margin of 100%. The North Island Project already has impressive economics. However, NCX is committed to improving the economics and the mine life further over the next year through an infill drilling program which will have the main objective of translating more of the inferred tonnes to indicated tonnes. NCX CEO, Jack McClintock, says the company expects to begin a 5,000+ meter infill drilling program in January 2018 which will likely consist of 10-12 additional holes. Given that Hushamu is a porphyry deposit, the holes do not have to be spaced as closely together to upgrade tonnes to indicated from inferred. Determine whether the existing infrastructure at BHP’s closed Island Copper Miner can be used (specifically the pit); this would mean that NCX has expanded the resource. NCX is trading at about ½ a cent per copper equivalent pound in the ground. Yes, that’s right, less than a penny (a copper penny) per copper equivalent pound in the ground! NCX’s extended light volume oscillation has built up potential energy for its next leg higher with a breakout above C$.19 targeting the C$.30 level. At its current market cap of ~C$17.7 million (114.3 million shares outstanding at C$.155 per share), NCX offers investors a low cost call option on higher copper & gold prices while still offering robust economics at current metals prices (US$3.10 copper and US$1,300 gold). Not to mention the potential for upgrading the resource and making a new discovery at the company’s 33,150 hectare North Island Project. The next year is set to be transformative for NorthIsle as the company solidifies project economics and mine planning in preparation for a pre-feasibility study with an expected completion within 18 months. 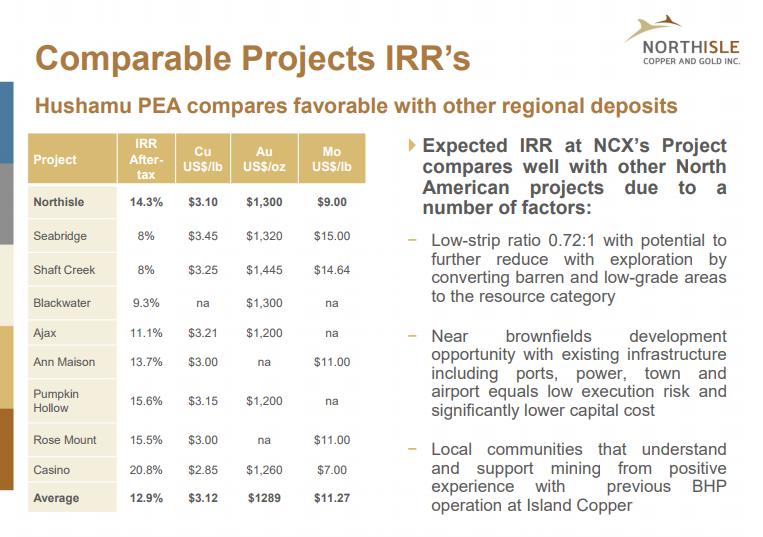 Simply stated, if you’re bullish on copper & gold prices, you should be bullish on NCX. Disclosure: The author is long NCX shares at the time of writing. Do your own due diligence. It’s your money and your responsibility.